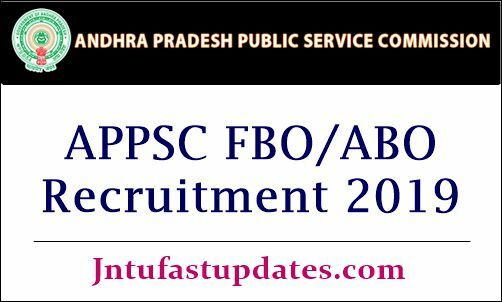 APPSC FBO/ABO Recruitment 2019: Andhra Pradesh Public Service Commission (APPSC) released the recruitment notification for 430 Forest Beat Officer (FBO) and Assistant Beat Officer (ABO) posts for Andhra Pradesh Forest Sub Service. Candidates wishing to get AP Forest Department jobs and having suitable eligibility credentials can apply for APPSC FBO and ABO jobs from 8th March to 27th March 2019. Eligible aspirants can apply through online at psc.ap.gov.in. Aspirants wishing to apply for APPSC FBO ABO posts can go through the official notification to check all the details of eligibility criteria, application process, selection process, and other details. It is important to go through all the details from the official notification before applying for the announced posts. Here the aspirants can download APPSC FBO Notification 2019 PDF from the following attachments. Andhra Pradesh Public Service Commission (APPSC) releases various recruitment notifications every year to recruit suitable candidates for various government jobs. This year the organization released the notification for 430 FBO and ABO posts for forest sub service in AP. Aspirants seeking to apply for forest beat officer posts can check ‘NOTIFICATION NO.07/2019, Dated:12.02.2019’ from the APPSC website, psc.ap.gov.in before applying for the announced posts. Candidates seeking to apply AP Forest Beat Officer jobs 2019 will have to register with the APPSC Website through One Time Profile Registration (OTPR). The user ID and password created at OTPR can be used for next proceedings. The User Id details will be sent to the applicant’s email and phone. Candidates seeking to apply for APPSC FBO posts can check more details from the following article. Aspirants applying for the FBO and ABO posts must have the minimum educational qualification of Intermediate/Equivalent. Candidates must also have the physical standards as mentioned in the notification. The clear details of physical standards have mentioned in the official notification. Go through the details to get the clarity. Candidate’s age limit must be within 18 to 30 years as on 1st July 2019. Age relaxation will be applicable for reservation category candidates as per the norms. Refer to the official notification for more information. Applicant must pay Rs. 250/- towards application processing fee and Rs 80/- towards examination fee. SC, ST, BC and other special category people will have to pay only Rs 80/-. The application fee to be paid through online using any debit/credit cards. Candidates have to get the minimum qualifying marks in each round to shortlist for the next round of selection process. APPSC FBO Qualifying marks are 40% for OCs, 35% for BCs, and 30% for SCs and STs or as per rules. Candidates shortlisted in all the rounds of the selection process with requisite cutoff marks will get the good pay scale and allowances as per norms. The pay band details are as follows. Interested and eligible candidates can apply through online at psc.ap.gov.in. Candidates have to go through the APPSC Forest Beat Officer Notification 2019 PDF clearly and proceed to apply through APPSC website. Candidates have to register with the APPSC website with One Time Profile Registration (OTPR). And after that, they can apply for the announced posts.